Water With A Mission helps provide clean water to students in Ethiopia. With a tagline, “Change your water, change your world,” Water With A Mission (WAMI) is making good on its promise to turn bottled water purchases into clean water for families in need. 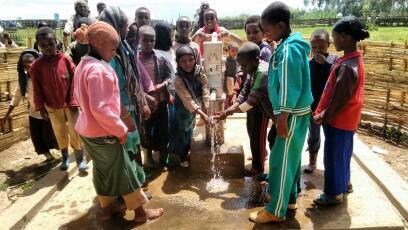 In partnership with Lifewater International, WAMI recently provided a clean water well for a primary school serving nearly 500 students in Ethiopia. This year WAMI partnered with Lifewater to make good on its promise to use proceeds from the water business to provide clean water for those in need. Raising over $6,000, WAMI decided to help students in Ethiopia get the clean water they needed to stay healthy and in school. As a result, on May 31, 2016, a safe water well was completed at the Ilu Dhina Primary School in the West Arsi Region in the highlands of central Ethiopia. The water source at Ilu Dhina Primary School funded by WAMI. While many urban Ethiopians have access to clean water, over half of the rural population still lacks access to this basic resource. The installation of water points at primary schools not only allows more children to attend school, but it helps their families and communities get healthier. At the Ilu Dhina Primary School, parents and teachers worked together with Lifewater staff to install the water point and construct blocks of latrines for the students. Stefanini and Jancovic traveled to Ethiopia with Lifewater staff to see the completed water source this summer, participating in a “water walk” to demonstrate the tremendous burden of retrieving water that is usually borne by women and children in underserved rural communities. Lifewater International is a non-profit Christian water development organization dedicated to effectively serving vulnerable children and families by partnering with underserved communities to overcome water poverty. With experience in more than 40 countries since 1977, Lifewater serves all people, focusing on contextually appropriate water, sanitation, and hygiene (WASH) development. For more information, contact Christine Zurbach (czurbach@lifewater.org) or visit www.lifewater.org. Lifewater International is based in San Luis Obispo, CA.